ESPN's draft coverage (which starts about three hours after the Super Bowl) is where the network hits rock bottom. 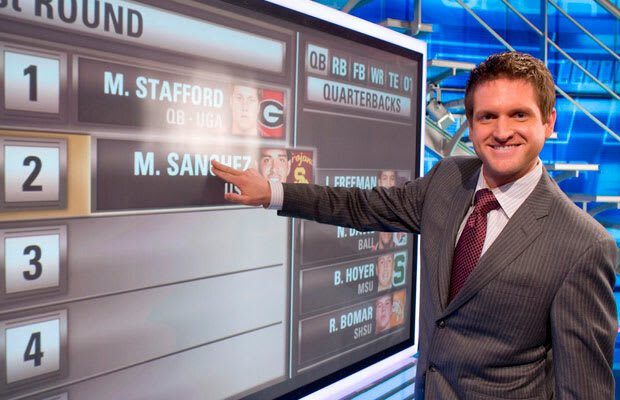 Mel Kiper Jr. crawls out of his coffin and spends the next hundred days screaming at the camera like a coked-out Count Dracula, pausing only to feign tension with the slightly more assured, but equally vomitus Todd McShay. And just when you think there's nothing more pathetic than two grown men arguing over the broad jumps and shuttle-times of 20-year-old college students, cue the NFL Live crew and their "Inside the War Room" reenactments. During an April 2012 edition of SportsCenter, in what was possibly the most absurd four minutes in the history of television, Trey Wingo, Herm Edwards, and Todd McShay made fake phone calls to fake GM’s and proposed fake trades for a fake draft. The goal? To show the audience what it would be like to go behind the scenes of teams' personnel decisions. The result? A table the full of weirdos inexplicably equating trade proposals to "coffee sweetener" and, rather miraculously, trading their fake second-round pick for a handful of fake third-rounders (impressive considering the value of Day Two picks). The segment was ridiculous, incredibly stupid, but pretty much par for the course when it comes to ESPN draft coverage.